AUD 3,763 Excl. Duties / Taxes. This Radiant diamond is 1.05 carat in weight, and comes with Good polish and Good symmetry, as verified from an independent gemological laboratory. The diamond is graded L in colour, and has a clarity grade of VS1. The diamond's GIA grading report number is 5151504193, which will detail further its specifications and measurements, and will also come with the purchase of the stone. AUD 9,599 Excl. Duties / Taxes. This Radiant diamond is 2 carat in weight, and comes with Excellent polish and Very Good symmetry, as verified from an independent gemological laboratory. The diamond is graded L in colour, and has a clarity grade of VS1. The diamond's GIA grading report number is 5161016396, which will detail further its specifications and measurements, and will also come with the purchase of the stone. AUD 13,925 Excl. Duties / Taxes. This Radiant diamond is 2.65 carat in weight, and comes with Very Good polish and Excellent symmetry, as verified from an independent gemological laboratory. The diamond is graded L in colour, and has a clarity grade of SI1. The diamond's GIA grading report number is 2155760875, which will detail further its specifications and measurements, and will also come with the purchase of the stone. AUD 46,428 Excl. Duties / Taxes. This Radiant diamond is 5.01 carat in weight, and comes with Very Good polish and Good symmetry, as verified from an independent gemological laboratory. The diamond is graded L in colour, and has a clarity grade of SI1. The diamond's GIA grading report number is 5192929778, which will detail further its specifications and measurements, and will also come with the purchase of the stone. AUD 52,834 Excl. Duties / Taxes. This Radiant diamond is 5.04 carat in weight, and comes with Very Good polish and Very Good symmetry, as verified from an independent gemological laboratory. The diamond is graded L in colour, and has a clarity grade of VVS2. The diamond's GIA grading report number is 6197506826, which will detail further its specifications and measurements, and will also come with the purchase of the stone. AUD 2,815 Excl. Duties / Taxes. This Radiant diamond is 1 carat in weight, and comes with Excellent polish and Excellent symmetry, as verified from an independent gemological laboratory. The diamond is graded L in colour, and has a clarity grade of SI1. The diamond's GIA grading report number is 6295964152, which will detail further its specifications and measurements, and will also come with the purchase of the stone. AUD 54,039 Excl. Duties / Taxes. This Radiant diamond is 5.07 carat in weight, and comes with Excellent polish and Very Good symmetry, as verified from an independent gemological laboratory. The diamond is graded L in colour, and has a clarity grade of VS1. The diamond's GIA grading report number is 2195038991, which will detail further its specifications and measurements, and will also come with the purchase of the stone. AUD 3,224 Excl. Duties / Taxes. This Radiant diamond is 1.02 carat in weight, and comes with Good polish and Good symmetry, as verified from an independent gemological laboratory. The diamond is graded L in colour, and has a clarity grade of SI1. The diamond's GIA grading report number is 2175325134, which will detail further its specifications and measurements, and will also come with the purchase of the stone. This Radiant diamond is 0.9 carat in weight, and comes with Excellent polish and Very Good symmetry, as verified from an independent gemological laboratory. The diamond is graded L in colour, and has a clarity grade of VVS2. The diamond's GIA grading report number is 16887515, which will detail further its specifications and measurements, and will also come with the purchase of the stone. AUD 3,003 Excl. Duties / Taxes. This Radiant diamond is 1.02 carat in weight, and comes with Very Good polish and Good symmetry, as verified from an independent gemological laboratory. The diamond is graded L in colour, and has a clarity grade of SI2. The diamond's GIA grading report number is 3195163752, which will detail further its specifications and measurements, and will also come with the purchase of the stone. AUD 3,926 Excl. Duties / Taxes. This Radiant diamond is 1.21 carat in weight, and comes with Very Good polish and Very Good symmetry, as verified from an independent gemological laboratory. The diamond is graded L in colour, and has a clarity grade of SI2. The diamond's GIA grading report number is 2186822536, which will detail further its specifications and measurements, and will also come with the purchase of the stone. AUD 12,230 Excl. Duties / Taxes. This Radiant diamond is 2.56 carat in weight, and comes with Very Good polish and Good symmetry, as verified from an independent gemological laboratory. The diamond is graded L in colour, and has a clarity grade of SI2. The diamond's GIA grading report number is 2195954309, which will detail further its specifications and measurements, and will also come with the purchase of the stone. This Radiant diamond is 1.09 carat in weight, and comes with Very Good polish and Very Good symmetry, as verified from an independent gemological laboratory. The diamond is graded L in colour, and has a clarity grade of VS2. The diamond's GIA grading report number is 2158170873, which will detail further its specifications and measurements, and will also come with the purchase of the stone. AUD 48,905 Excl. Duties / Taxes. This Radiant diamond is 5.03 carat in weight, and comes with Very Good polish and Good symmetry, as verified from an independent gemological laboratory. The diamond is graded L in colour, and has a clarity grade of VS2. The diamond's GIA grading report number is 2173056272, which will detail further its specifications and measurements, and will also come with the purchase of the stone. AUD 3,702 Excl. Duties / Taxes. This Radiant diamond is 1.03 carat in weight, and comes with Very Good polish and Very Good symmetry, as verified from an independent gemological laboratory. The diamond is graded L in colour, and has a clarity grade of VS1. The diamond's GIA grading report number is 2131745258, which will detail further its specifications and measurements, and will also come with the purchase of the stone. AUD 9,400 Excl. Duties / Taxes. This Radiant diamond is 1.7 carat in weight, and comes with Good polish and Good symmetry, as verified from an independent gemological laboratory. The diamond is graded L in colour, and has a clarity grade of SI1. The diamond's GIA grading report number is 2203041432, which will detail further its specifications and measurements, and will also come with the purchase of the stone. This Radiant diamond is 0.5 carat in weight, and comes with Very Good polish and Very Good symmetry, as verified from an independent gemological laboratory. The diamond is graded L in colour, and has a clarity grade of VS2. The diamond's GIA grading report number is 2155416868, which will detail further its specifications and measurements, and will also come with the purchase of the stone. AUD 2,331 Excl. Duties / Taxes. This Radiant diamond is 0.95 carat in weight, and comes with Very Good polish and Good symmetry, as verified from an independent gemological laboratory. The diamond is graded L in colour, and has a clarity grade of VS1. The diamond's GIA grading report number is 11741134, which will detail further its specifications and measurements, and will also come with the purchase of the stone. This Radiant diamond is 4.37 carat in weight, and comes with Very Good polish and Good symmetry, as verified from an independent gemological laboratory. The diamond is graded L in colour, and has a clarity grade of VS2. The diamond's AGS grading report number is 104103845004, which will detail further its specifications and measurements, and will also come with the purchase of the stone. This Radiant diamond is 1.01 carat in weight, and comes with Excellent polish and Good symmetry, as verified from an independent gemological laboratory. The diamond is graded L in colour, and has a clarity grade of VS1. The diamond's GIA grading report number is 6147683351, which will detail further its specifications and measurements, and will also come with the purchase of the stone. AUD 3,035 Excl. Duties / Taxes. This Radiant diamond is 1.02 carat in weight, and comes with Very Good polish and Good symmetry, as verified from an independent gemological laboratory. The diamond is graded L in colour, and has a clarity grade of VS2. The diamond's GIA grading report number is 5101254250, which will detail further its specifications and measurements, and will also come with the purchase of the stone. AUD 6,634 Excl. Duties / Taxes. This Radiant diamond is 1.41 carat in weight, and comes with Very Good polish and Good symmetry, as verified from an independent gemological laboratory. 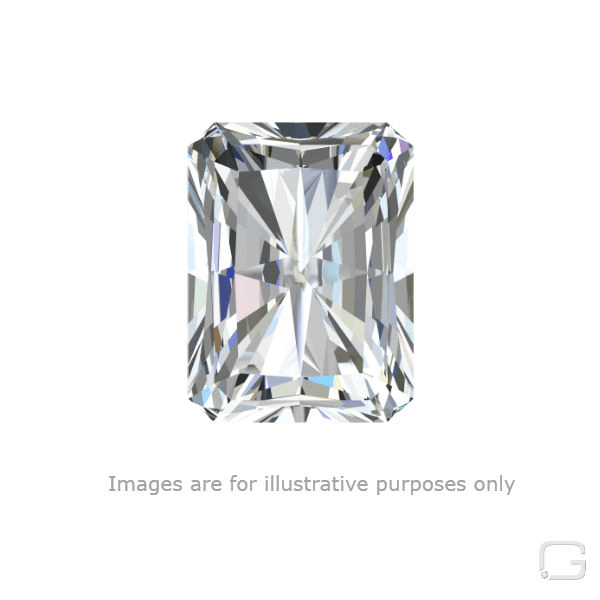 The diamond is graded L in colour, and has a clarity grade of VVS2. The diamond's GIA grading report number is 6245769595, which will detail further its specifications and measurements, and will also come with the purchase of the stone. AUD 4,858 Excl. Duties / Taxes. This Radiant diamond is 1.2 carat in weight, and comes with Very Good polish and Very Good symmetry, as verified from an independent gemological laboratory. The diamond is graded L in colour, and has a clarity grade of SI1. The diamond's GIA grading report number is 2165555831, which will detail further its specifications and measurements, and will also come with the purchase of the stone. AUD 8,820 Excl. Duties / Taxes. This Radiant diamond is 2.06 carat in weight, and comes with Excellent polish and Very Good symmetry, as verified from an independent gemological laboratory. The diamond is graded L in colour, and has a clarity grade of SI2. The diamond's GIA grading report number is 5192668076, which will detail further its specifications and measurements, and will also come with the purchase of the stone. This Radiant diamond is 1.01 carat in weight, and comes with Very Good polish and Good symmetry, as verified from an independent gemological laboratory. The diamond is graded L in colour, and has a clarity grade of VVS1. The diamond's GIA grading report number is 2151196822, which will detail further its specifications and measurements, and will also come with the purchase of the stone. AUD 9,916 Excl. Duties / Taxes. This Radiant diamond is 2.06 carat in weight, and comes with Excellent polish and Very Good symmetry, as verified from an independent gemological laboratory. The diamond is graded L in colour, and has a clarity grade of VS2. The diamond's GIA grading report number is 2111611102, which will detail further its specifications and measurements, and will also come with the purchase of the stone. AUD 5,469 Excl. Duties / Taxes. This Radiant diamond is 1.42 carat in weight, and comes with Good polish and Good symmetry, as verified from an independent gemological laboratory. The diamond is graded L in colour, and has a clarity grade of VS1. The diamond's GIA grading report number is 2185123421, which will detail further its specifications and measurements, and will also come with the purchase of the stone. This Radiant diamond is 1.09 carat in weight, and comes with Very Good polish and Good symmetry, as verified from an independent gemological laboratory. The diamond is graded L in colour, and has a clarity grade of VS2. The diamond's GIA grading report number is 12668228, which will detail further its specifications and measurements, and will also come with the purchase of the stone. AUD 9,754 Excl. Duties / Taxes. This Radiant diamond is 2.01 carat in weight, and comes with Very Good polish and Very Good symmetry, as verified from an independent gemological laboratory. The diamond is graded L in colour, and has a clarity grade of SI2. The diamond's GIA grading report number is 6197476328, which will detail further its specifications and measurements, and will also come with the purchase of the stone.